In this extraordinary piece, Moore creates a universal image of man, evoking a sense of the body that is simultaneously monolithic and fragile. Between 1950 and 1952 Moore made an increasing number of upright, standing figures, as opposed to his more iconic reclining nudes. The figures in these works are more abstracted and geometric, demonstrating the recent influence of his highly stylised Helmet Heads. 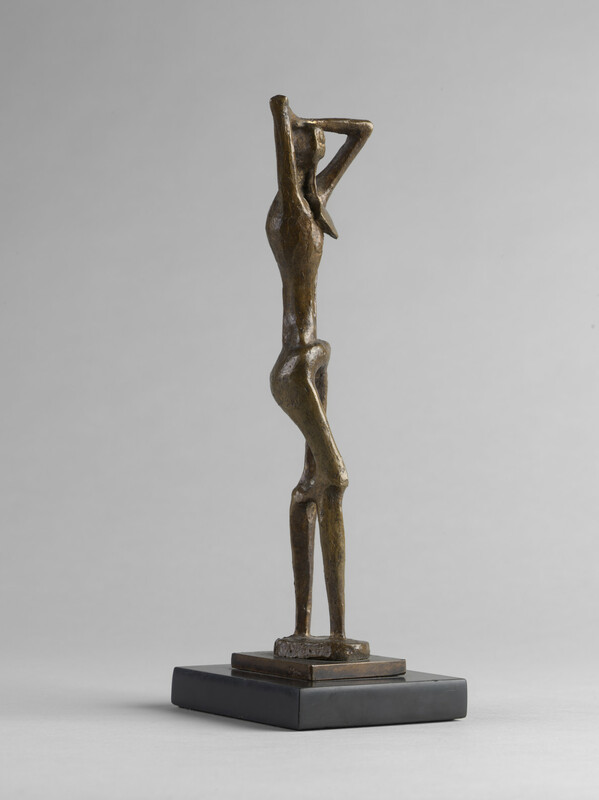 In the present work, the first of a series of five Standing Figures made in 1952, Moore highlights the inherent contradictions of the human body. His angular figure is at once strong and fragile, ancient and modern, presence and void, in a manner akin to the work of Giacometti and that of the younger 'Geometry of Fear’ group of artists. 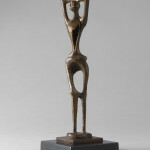 'Standing Figure no.1' relates closely to the monumental bronze 'Double Standing Figure' 1950 (now held at The Frances Lehman Loeb Art Center in Vasser College, Arlington) which stood outside the British Pavilion at Venice Biennale in 1952, signalling the connection between this body of work and that of the younger generation of British sculptors. Moore’s understanding of the rich multiplicity of natural forms was often inspired by the interpretation of objects such as pebbles, shells, driftwood and bones, which lined the walls of his studio at Perry Green. In this work, Moore explores the movement of the human body and spaces between the limbs revealing the cavities within and creating a connection between the internal and external body. 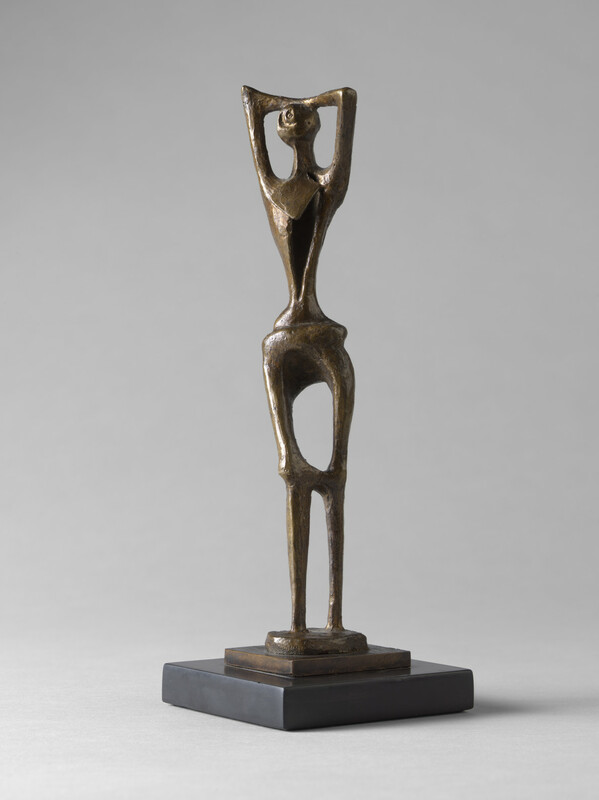 'Standing Figure no.1' emphasises the skeletal frame and the kinetic dynamism of the body; Moore later said, "...the bone is the inner structure of all living form. It’s the bone that pushes out from the inside; as you bend your leg the knee gets tautness over it, and it’s there that the movement and energy come from." Moore would famously utilise this bone-like imagery in his monumental sculpture 'The Arch' 1979-80, in Hyde Park in London. The shape of 'The Arch' is highly reminiscent of the crevice-like forms of the pelvis found in the present work and demonstrates how Moore would return repeatedly to motifs throughout his career.